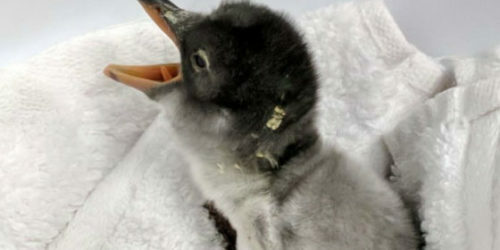 Sphen and Magic, a gay penguin couple at the Sea Life Sydney Aquarium, are dads now. Aquarium staff noticed the two had paired up after Sphen gave Magic a special stone that zookeepers said is “equivalent to proposing in the love language of penguins.” Soon the two male penguins were gathering pebbles to make a nest. “[They] are constantly seen waddling around and going for swims together in the Penguin Expedition,” the aquarium said in a statement when they gave the couple the egg. Five weeks later, Baby Sphengic has hatched and the doting dads are are on the case. The baby’s gender will be determined later with a blood test. Gentoo penguins, which live on sub-Antarctic islands, only have enough resources to care for one of the two eggs they lay. The other chick frequently dies, so staff gave the “extra” egg to Sphengic.